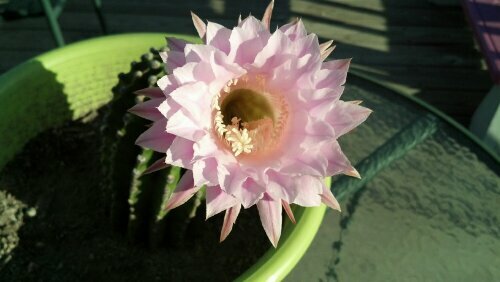 Lissa’s cactus had finally bloomed. One gorgeous pink flower that lasted a little over a day. Joe stood on the deck admiring it. By the next day, the flower had shriveled and fallen off onto the deck. Joe frowned, staring at the spot on the cactus where the flower used to be. He squinted his eyes and looked closer…something was moving on the cactus. He looked closer still and saw a tiny black and gray spider crawling around a cactus spine. He knew what he had to do. He went into his room and, making sure no one was watching, opened the secret compartment in his toy box. He pulled out his safari hat, bug house and bug gun. These are the tools he would need to investigate what had happened to the flower…for Joe just knew that the spider had something to do with it’s untimely demise. Joe the Bug Hunter was on the case! This entry was posted in Adventures in Homesteading, Joe the Bug Hunter, Writing. Bookmark the permalink. Love this! Joe the explorer!